Taking advantage of the capacities of the VLT Survey Telescope (VST) at ESO's Paranal Observatory in Chile, astronomers captured this very detailed new image of the Tarantula Nebula and its numerous neighbouring nebulae and star clusters. 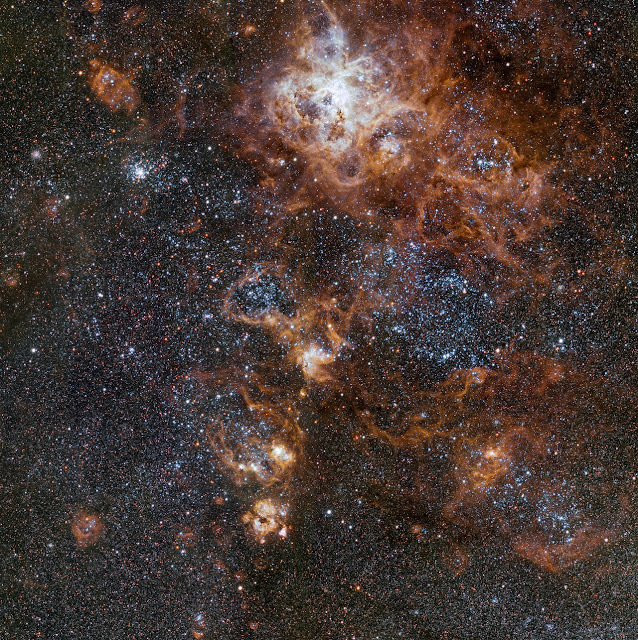 The Tarantula, which is also known as 30 Doradus, is the brightest and most energetic star-forming region in the Local Group of galaxies. At the centre of the image is the star cluster and emission nebula NGC 2074, another massive star-forming region discovered by John Herschel. Taking a closer look one can spot a dark seahorse-shaped dust structure -- the "Seahorse of the Large Magellanic Cloud". This is a gigantic pillar structure roughly 20 light-years long -- almost five times the distance between the Sun and the nearest star, Alpha Centauri. The structure is condemned to disappear over the next million years; as more stars in the cluster form, their light and winds will slowly blow away the dust pillars. Obtaining this image was only possible thanks to the VST's specially designed 256-megapixel camera called OmegaCAM. The image was created from OmegaCAM images through four different coloured filters, including one designed to isolate the red glow of ionised hydrogen.